So. This is my blog. Honestly I am not totally sure what I want this to be. I mean, like am I writing an entertainment blog? Because the good Lord knows I watch enough televsion to write one. Am I writing a blog to promote and support my upcoming book (don’t get too excited; I’ve been working on it for almost 2 years. THEN I have to find a agent, publisher, etc. ad nauseum)? Am I writing a thinly veiled account of my experiences as a teacher? A few years ago I had a blog on Xanga. It’s cool. I can wait for you to stop laughing and wipe up the Sprite you just snorted/spewed all over your computer screen. Yeah. I was one of those. And I really liked most of what I wrote there- specifically my Top 10 lists. Hmmm. I may need to try and get back into mine so I can retrieve those posts. Anyway, rabbit trail…. Okay. I may have taken the long way around to get here, but I know what I want to tell you about today. So, it’s Wednesday. It’s currently 7:48 and a week ago right now I was watching the series finale of what had become one of my very most favoritest shows. One Tree Hill. I know, I need to give you all warning if I’m going to keep writing stuff like this. Otherwise your laptop screen will never be the same. So yeah, OTH totally rocked my world for a few years. Confession? It was on for 9 years. I only watched it “live” for the last 2. Please don’t hate. Over Christmas break 2009 I began watching Season 1. I think I flew through it in about 4 days. What? I was bored. Anyway I bought season 2 at Target or something and began to watch. I think I saw half an episode and then it ended up on a shelf in the living room. Fast forward to June. I figured I may as well give it another try. And then before I knew it, I had ordered seasons 3-6 off of ebay and went out and bought season 7 at my beloved Target (which really should be my next post….) and was ready to rock and roll by the time season 8 premiered in mid-September. So, among the many questions that are flying around your head right now, I am guessing the pre-dominant one is “WHY??? ?” I get it. I have that reaction to people who love SpongeBob and the Simpsons (ducks to avoid things being thrown at her head). You’ll never really understand this probably, but- and this mostly applies to seasons 1-4 and 9- the characters made me want to be a better friend to the people who mean a lot to me. Also, I saw a lot of myself in the characters. To most people it was just another cheesy, unrealistic teenager show with plot lines so ridiculous they actually had to make fun of themselves (see: season 4; the episode when they went to Honey Grove, TX), and there were a lot of episodes that made me roll my eyes too. But on a deeper level (Yes, there were deeper levels. Stop laughing!!) I got it. I identified with Brooke in her quest for love and watching that love go to someone else. I identified with Haley and her relationship with her best friend Lucas, and her teaching career and her love of music. I identified with Lucas, who was once an outcast and used that to write his book. I identified with Peyton because she had a stalker…. (Oh, so many stories to share with you). I did not so much identify with Nathan because I am not 6′ 4″, I did not marry in high school and I had a GREAT relationship with my dad 🙂 I loved the way they skipped over college and came back in season 5 as 22/23 year old adults. I loved that despite what she had been told, Brooke and Julian got pregnant and she had the twins. I loved that in the end Haley was Brooke’s Matron on Honor and that Brooke realized that it was Haley who had been there all along and not Peyton. I loved that Chris Keller went out the way he came in; mackin’ on the ladies. I LOVED that they gave Dan the redemption that Paul Johanssen so deserved. I love that you are still reading this, despite the fact that you probably never watched this show. Last week my friends Lesli and Jessica came over to watch the series finale with me. It was both everything we could have wanted in a series finale and a sad reminder of the hole that will be in our Wednesday nights and, for Jess and me, our Thursday morning cafeteria duty debriefs. It was a great show. 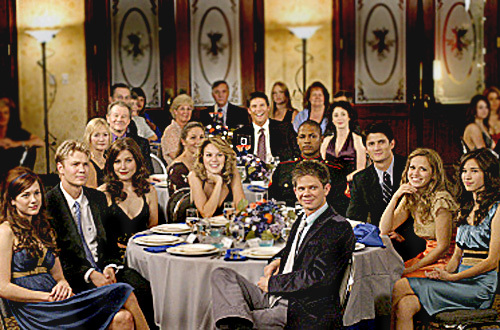 I am so glad they brought it back for the abbreviated 9th season so that we could truly say goodbye. Ok, now you think I’m crazy. I might be okay with that. Because I think you’ll come back to see what I say next. And who knows, my next entry might be about…..